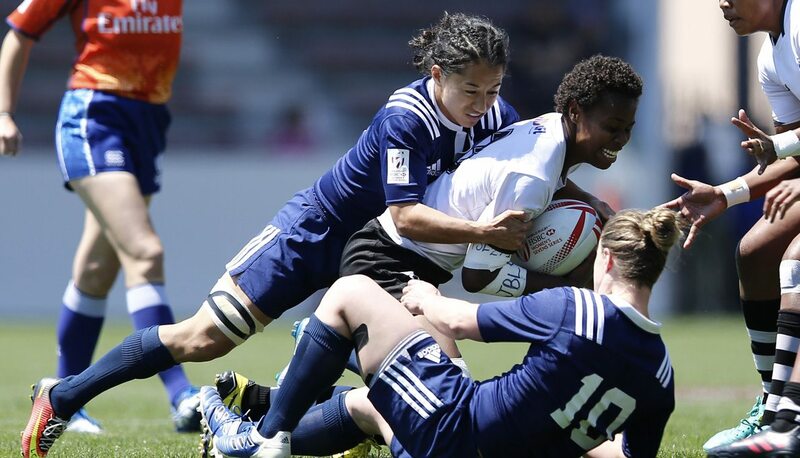 KITAKYUSHU, Japan - The Women's Eagles Sevens could not maintain a seven-minute lead against Fiji Saturday in a 26-19 HSBC Kitakyushu Sevens Cup Quarterfinal loss. Richie Walker's side had finished second in Pool C prior to its matchup with Pool B's second-place finisher, which advances to the Cup Semifinals. The Eagles will fight for fifth place at the fourth round of the 2016-17 HSBC World Rugby Women's Sevens Series, beginning with a Fifth-Place Semifinal against England Sunday at 12:14 a.m. ET. Under the sun just before noon in Japan, both teams felt the heat and pressure of the knockout match. Mishandling of possession found the ball in U.S. and Fijian hands, with an early scrum against Fiji preceding a missed opportunity for Joanne Fa'avesi to open a gap for Alev Kelter as the captain dropped the pass. Kelter won a turnover with a needed tackle in the third minute as Fiji found some space, and the Eagles spread the ball wide to Kristen Thomas. The wing made the defender second-guess her run, and beat her opposite number for the opening try, 7-0. The Eagles defended a penalty from the ensuing restart well with Fa'avesi intercepting a pass, but she lost it forward. Another penalty against the U.S. in the scrum gave Fiji a tap, which was taken at the 22 before Raijieli Daveua beat the chasing defense beside the posts. Fiji's conversion attempt had missed its target with seconds remaining in the half, and the Eagles went to work to extend their lead before the break. Kelter shored up miscommunication in the middle of the field from a tap to get the ball out to Tapper, who lost her footing trying to break a tackle beyond the 22. After a tap 10 meters from the posts, simple passing gave Tapper time to run at the corner for the 12-5 score. A dropped pass from the restart gave Fiji a put-in at its own 10 to kick off the second half, and Miriama Naiobasali took a line at Kelly Griffin and fended the Eagle to even the score at 12-12. The U.S. mimicked a typical Fijian attack from the restart with Griffin and Nicole Heavirland offloading to keep play moving past the 10, where the ball popped out of a tackle on Thomas. Fiji did not immediately punish the turnover after Tima Ravisa dropped a pass on the wing, but the Eagles were whistled for a penalty in the next phase. Fiji found half-gaps in the U.S. defense to gain midfield in the 12th minute before substitute Jordan Gray made a tackle from behind to force the ball loose. The Eagles could not keep it, however, and Ravisa rounded Thomas for the go-ahead, 19-12, score. Rusila Nagasau intercepted a pass by reserve Kelsi Stockert as the Eagles looked to respond from behind their 22, putting the game out of reach at 26-12. Tapper brought the final score closer after Bulou Mataitoga ran at the defense from the final restart, with Kelter's impressive conversion bringing things to an end, 26-19. The Eagles can add 12 points to their Series standing should they finish fifth this weekend. They can reach the Fifth-Place Final with a win against England, a pool play opponent they beat, 27-5, yesterday, in the Semifinal at 12:14 a.m. ET Sunday. World Rugby's broadcast can be watched live on The Rugby Channel.